A painting I used to own. 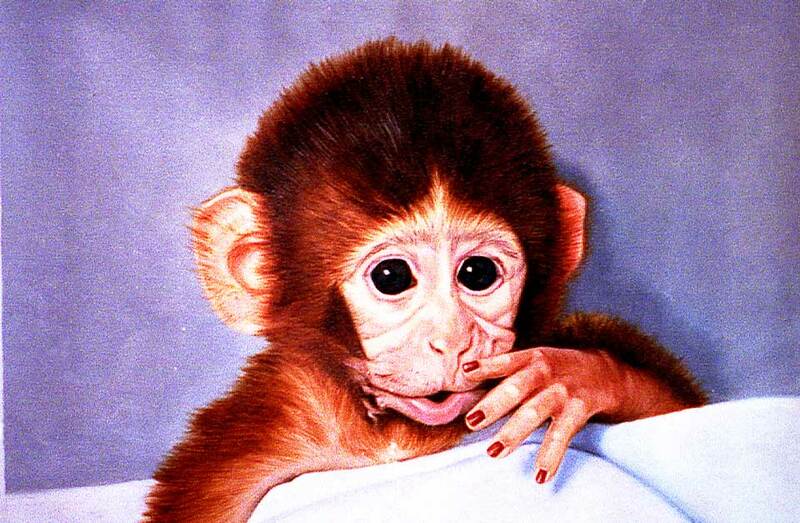 Yes, I owned an oil painting of a baby monkey. So many of the effects of sudden spiritual enlightenment are similar to those of the mentally ill. What if you are just insane? This is a really important issue. If you are having a psychotic break, then you need help. If you are going through sudden spiritual enlightenment, you should not be mistakenly diagnosed with schizophrenia or bipolar disorder. But how can you tell the difference? I do not have any easy answers for you. I have never been mentally ill, so I have nothing to compare it to, personally. I have been around people who were having psychotic breaks and believed they were finally enlightened. It was pretty scary, really. Here are some things to look out for. Do you feel manic? It’s different than the increased intensity and energy that comes with spiritual awakening. People who are manic have an excess of unstable energy that is always seeking external experience, release, stimulation. Do you feel special, important, or chosen? Spiritual awakening dissolves the hard reality of your ego. Even if you were the Messiah, you wouldn’t feel messianic. Do you hear voices that tell you to do things that are dangerous, drastic or hurtful to yourself or others? Not a good sign! If you are experiencing sudden inedia or what many call Breatharianism, how is your body doing? Are you losing a lot of weight? It’s okay and normal to shed extra pounds, but not more than that. At no time should you feel tired, low energy or wasted. Your immune system should remain strong, and all outward signs of health, such as skin, nails and hair, should be in good condition. You should not experience dizziness, weakness, or really anything negative. And you shouldn’t be trying to be inedic! Your body either needs food or it doesn’t, it’s not something you make happen. Symptoms of mental illness or effects of enlightenment? Not eating: anorexic or inedic (Breatharian)? Not sleeping: manic phase of bipolar or experiencing cosmic consciousness? Hearing things: schizophrenic, bipolar, psychotic…or experiencing states of expanded awareness? Experiencing bliss states, or Christ consciousness: delusional, manic…or returning to oneness with all creation? Awareness of the non-reality of things and subsequent radical detachment: pathological nihilism or experience of the Absolute, or Void? Who is qualified to tell the difference? The bottom line is that I don’t know how to tell the difference for other people at a distance. Psychiatrists are not trained to understand the difference, either. This remains a difficult subject, and I fear that there are plenty of people who are going through spiritual awakening or kundalini activation who are diagnosed as mentally ill. Conversely, if you look at what a circus the spiritual enlightenment factions and characters can put on, it seems that some of them could use a good shrink! I am extremely grateful for two things: the unwavering support of my family and closest friends, and that I had a lifelong history of being exceptionally stable, grounded and practical. That was my constitutional makeup. My awakening was not precipitated by any emotional turmoil, as seems to be common. I was just walking in the woods at night, and then, AWAKE! So my personality and everything that I had developed prior to waking was stable, calm and responsible. I had built up a huge store of credibility with those close to me, and even though many of the effects were dramatic, I didn’t do anything dangerous or worrisome. I was in bliss, not turmoil. My family believed and supported me, and I am deeply grateful. I wish the same for all of you who are going through this transition. If you are not so lucky, then still know this: you are not alone. It may be small comfort, but those of us who have gone before do send out love and comfort and support to you. Can you say more about the type of transition you experienced? Did you awakening experience cause any unresolved emotional content to arise or much difficulty or did you suddenly just drop attachment to your ego? Just about a year ago I experienced the awakening of my kundalini but shortly after that I fell into depression and feel that I was releasing some deeply held spiritual trauma. Later I started realizing the parallel between this experience and bipolar and am now very curious about what is the difference? So ya, my experience has had a lot of ups (feeling very spiritually connected) and downs (while it feels like I am releasing negativity) but it sounds like your experience did not have any downs. Is that true? Thanks so much for sharing your experience. I did not have any depression or “down swings” that people report. The hardest thing for me was getting used to all the changes, which I’ve only begun to document here. If you’ve read them, you know they were really out there. People started reacting strangely to me, and there was the uncertainty of not knowing where any of this was going. It was pretty weird, but I did not experience any kind of depression. The instantaneous release from what people often call the “ego” did not then catalyze an upswelling of unresolved emotional issues. However, I have read in many places that my experience is less common and the experience of depression and emotional healing crisis are quite common, especially with Kundalini activation, which is not the same as awakening and release of ego fixation. Those are distinct experiences. Kundalini can happen to people who are not ready for it. I only had Kundalini after my awakening, in which case there was nothing there to get stirred up, in terms of old emotional patterns or trauma or pain. Bipolar disorder should not be conflated with the experience of Kundalini and emotional release. I don’t know if you’ve ever known anyone with actual Bipolar disorder, but I have been very close to many people who are diagnosed, and these things are not the same. Their mood swings are often cyclical, seasonal, predictable and have never, in my experience, yielded any kind of healing. The peak of the highs are destructive and the nadir of the lows are also destructive. True spiritual work, where you are experiencing a wide range of emotion and energy states as you clear and process leaves you better off, even if it does rearrange your life quite drastically sometimes. I don’t know many people with BP who feel like they got a lot out of those manic highs and unbearable lows. However, if you had BP prior to the Kundalini, that could kindle it, I suppose. I’m not a doctor and can’t give you medical or psychiatric advice. All I can say is that ultra sanity looks an awful lot like insanity, depending on who is doing the assessment. Just the fact that you have a wide range while you are repatterning doesn’t necessarily mean anything. My very best to you, Lee. I hope you’ll check back and let us know how you are settling in to these changes.